Highlighted by tall palm trees, the glittering-glass-tiled pool and spa in Highland, Texas, is a veritable tropical paradise. Designed by Harold Leidner Landscape Architects in Carrollton, Texas, and built by First Class Pools and Spas in Sachse, Texas, the poolscape, which features a variety of Pentair products, won the 2018 gold award from the APSP International Pool Awards for spas built in conjunction with swimming pools. Harold Leidner Landscape Architects of Carrollton, Texas accented the water wall with a trio of pear trees and a pair of tall palms. Photo by Jimi Smith. The owners, a couple with college-age children, envisioned the backyard as an extension of their newly built modern French/Mediterranean-style house. They wanted the indoor and outdoor spaces to flow into each other and create an elegant setting that encourages guests to mingle. Leidner and Mike Light, president of First Class Pools and Spas, are particularly proud of the Pentair LED lighting that casts a glow around the perimeter of the pool. 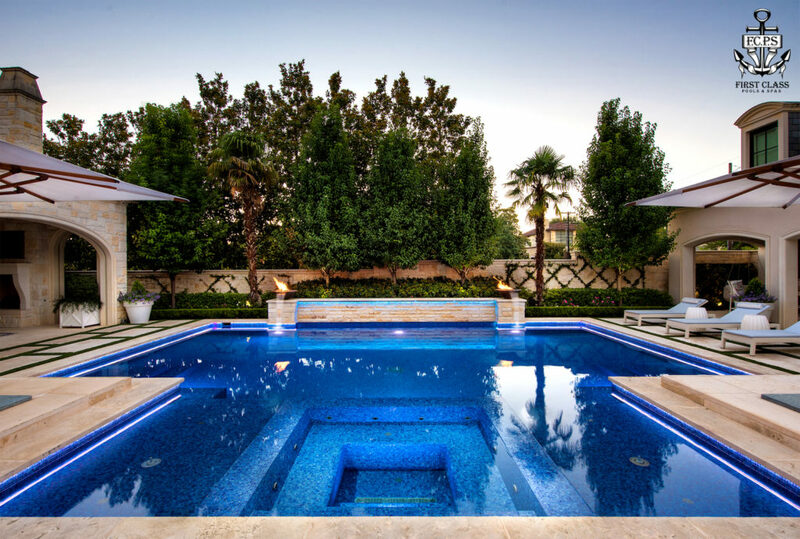 The dramatic play of fire and water creates a stunning scene; Pentair products were used throughout the project, which was built by First Class Pools and Spas of Sachse, Texas. Photo by Jimi Smith. The pool, spa, and fire pit are centered on the one-acre site, which features the house on one side and the cabana guesthouse on the other. The buildings are clad in Austin limestone, and to tie the elements together, Leidner used the same stone as a surround for the pool and spa as well as for the water wall and the property-boundary wall. Brilliant blue one-inch Bisazza glass tiles turn the pool and spa into a sparkling ocean. The pool, which features an embedded spa, is made of blue 1-inch Bisazza glass tiles that create an ocean-like look that sparkles day and night. Photo by Jimi Smith. The key feature of Leidner’s design is the integration of the spa into the pool so that they read as one element. “I embedded it to make the body of water look bigger,” he says. Mike Light, president of First Class Pools and Spas, says that the spa’s contoured walls and seats blur the boundaries between the two even further. The pool/spa combo is introduced by a water wall made of Austin limestone that is accented with a pair of bowls that shoot fire and spout water. At the poolscape’s foot, there’s an open fire pit centered on the spa. The real beauty of the project, says Light, lies in the elements that remain hidden from the eye. He used a variety of Pentair products, including the 4000 BTU MasterTemp heater, the Ultratemp 140 heat pump chiller system, Intelliflo pumps, and GloBrite lights that add drama to the water wall, to create the award-winning oasis. The features of the poolscape come alive with the Pentair IntelliTouch system, which monitors and activates everything from the lighting to the heater via a smartphone or iPad. The water table designed by Harold Leidner Landscape Architects of Carrollton, Texas is a focal point of the outdoor kitchen. Photo by Jimi Smith. Leidner’s landscape complements the hardscape, giving it a green lushness that invites all who enter to linger by the water while sun bathing or star gazing. The joints between the limestone pavers on the deck are filled with artificial grass, a design theme that is picked up with live vines that wind through the boundary wall’s diamond-shaped trellis. The water wall, which is a focal point and a foil to the fire pit it faces, is flanked by a pair of palm trees and planted with a trio of mature pear trees that provide shade and privacy from neighboring homes. At night, the trees are uplighted to great effect against the illuminated wall. Light says the perimeter LED pool lighting, as well as the fire bowls bookending the water wall and the fire pit, made it a fun project to build.